Carbon monoxide poisoning occurs after breathing in too much carbon monoxide (CO). Symptoms of mild acute poisoning include lightheadedness, confusion, headache, feeling like the world is spinning, and flu-like effects. Larger exposures can lead to toxicity of the central nervous system and heart, and death. After acute poisoning, long-term problems may occur. Carbon monoxide can also have negative effects on a baby if exposed during pregnancy. Chronic exposure to low levels of carbon monoxide can lead to depression, confusion, and memory loss. Carbon monoxide is a toxic gas, but, being colorless, odorless, tasteless, and initially non-irritating, it is difficult for people to detect. Carbon monoxide is a product of incomplete combustion of organic matter. It is often produced by motor vehicles that run on gasoline, diesel, methane, or other carbon-based fuels and from tools, gas heaters, and cooking equipment that are powered by carbon-based fuels such as propane, butane and charcoal. Exposure at 100 ppm or greater can be dangerous to human health. Carbon monoxide mainly causes adverse effects by combining with hemoglobin to form carboxyhemoglobin (HbCO) in the blood. This prevents hemoglobin from carrying oxygen to the tissues,. Additionally, myoglobin and mitochondrial cytochrome oxidase are thought to be adversely affected. Carboxyhemoglobin can revert to hemoglobin, but the recovery takes time as the HbCO complex is fairly stable. Treatment of poisoning largely consists of giving 100% oxygen or providing hyperbaric oxygen therapy, although the optimum treatment remains controversial. Oxygen works as an antidote as it increases the removal of carbon monoxide from hemoglobin, in turn providing the body with normal levels of oxygen. The prevention of poisoning is a significant public health issue. Domestic carbon monoxide poisoning can be prevented by early detection with the use of household carbon monoxide detectors. Carbon monoxide poisoning is the most common type of fatal poisoning in many countries. It has also commonly been used as a method to commit suicide, usually by deliberately inhaling the exhaust fumes of a running vehicle. Modern automobiles still produce levels of carbon monoxide which will kill if enclosed within a garage or if the tailpipe is obstructed (for example, by snow). Carbon monoxide poisoning has also been speculated as a cause of apparent haunted houses; symptoms such as delirium and hallucinations may have led people who have been poisoned to think they have seen ghosts. 12,800 ppm (1.28%) Unconsciousness after 2–3 breaths. Death in less than three minutes. Chronic exposure to relatively low levels of carbon monoxide may cause persistent headaches, lightheadedness, depression, confusion, memory loss, nausea and vomiting. It is unknown whether low-level chronic exposure may cause permanent neurological damage. 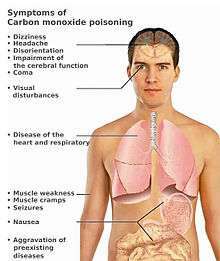 Typically, upon removal from exposure to carbon monoxide, symptoms usually resolve themselves, unless there has been an episode of severe acute poisoning. However, one case noted permanent memory loss and learning problems after a 3-year exposure to relatively low levels of carbon monoxide from a faulty furnace. Chronic exposure may worsen cardiovascular symptoms in some people. Chronic carbon monoxide exposure might increase the risk of developing atherosclerosis. Long-term exposures to carbon monoxide present the greatest risk to persons with coronary heart disease and in females who are pregnant. Riding in pickup trucks has led to poisoning in children. Idling automobiles with the exhaust pipe blocked by snow has led to the poisoning of car occupants. Any perforation between the exhaust manifold and shroud can result in exhaust gases reaching the cabin. Generators and propulsion engines on boats, especially houseboats, has resulted in fatal carbon monoxide exposures. In caves carbon monoxide can build up in enclosed chambers due to the presence of decomposing organic matter. In coal mines incomplete combustion may occur during explosions resulting in the production of afterdamp. The gas is up to 3% CO and may be fatal after just a single breath. Following an explosion in a colliery adjacent, interconnected, mines may become dangerous due to the afterdamp leaking from mine to mine. Such an incident followed the Trimdon Grange explosion which killed men in the Kelloe mine. Carbon monoxide has a higher diffusion coefficient compared to oxygen and the only enzyme in the human body that produces carbon monoxide is heme oxygenase which is located in all cells and breaks down heme. Under normal conditions carbon monoxide levels in the plasma are approximately 0 mmHg because it has a higher diffusion coefficient and the body easily gets rid of any CO made. When CO is not ventilated it binds to hemoglobin, which is the principal oxygen-carrying compound in blood; this produces a compound known as carboxyhemoglobin. The traditional belief is that carbon monoxide toxicity arises from the formation of carboxyhemoglobin, which decreases the oxygen-carrying capacity of the blood and inhibits the transport, delivery, and utilization of oxygen by the body. 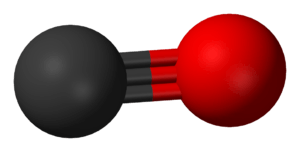 The affinity between hemoglobin and carbon monoxide is approximately 230 times stronger than the affinity between hemoglobin and oxygen so hemoglobin binds to carbon monoxide in preference to oxygen. A CO-oximeter is used to determine carboxyhemoglobin levels. Pulse CO-oximeters estimate carboxyhemoglobin with a non-invasive finger clip similar to a pulse oximeter. These devices function by passing various wavelengths of light through the fingertip and measuring the light absorption of the different types of hemoglobin in the capillaries. The use of a regular pulse oximeter is not effective in the diagnosis of carbon monoxide poisoning as people suffering from carbon monoxide poisoning may have a normal oxygen saturation level on a pulse oximeter. This is due to the carboxyhemoglobin being misrepresented as oxyhemoglobin. Breath CO monitoring offers a viable alternative to pulse CO-oximetry. Carboxyhemoglobin levels have been shown to have a strong correlation with breath CO concentration. However, many of these devices require the user to inhale deeply and hold their breath to allow the CO in the blood to escape into the lung before the measurement can be made. As this is not possible in a nonresponsive patient, these devices are not appropriate for use in on-scene emergency care detection of CO poisoning. Carbon monoxide may be quantitated in blood using spectrophotometric methods or chromatographic techniques in order to confirm a diagnosis of poisoning in a person or to assist in the forensic investigation of a case of fatal exposure. Carboxyhemoglobin blood saturations may range up to 8–10% in heavy smokers or persons extensively exposed to automotive exhaust gases. In symptomatic poisoned people they are often in the 10–30% range, while persons who succumb may have postmortem blood levels of 30–90%. The ratio of carboxyhemoglobin to hemoglobin molecules in an average person may be up to 5%, although cigarette smokers who smoke two packs/day may have levels up to 9%. Prevention remains a vital public health issue, requiring public education on the safe operation of appliances, heaters, fireplaces, and internal-combustion engines, as well as increased emphasis on the installation of carbon monoxide detectors. Carbon monoxide is tasteless and odourless so can not be detected by smell. The NFPA standard is not necessarily enforced by law. As of April 2006, the U.S. state of Massachusetts requires detectors to be present in all residences with potential CO sources, regardless of building age and whether they are owner-occupied or rented. This is enforced by municipal inspectors, and was inspired by the death of 7-year-old Nicole Garofalo in 2005 due to snow blocking a home heating vent. Other jurisdictions may have no requirement or only mandate detectors for new construction or at time of sale. Initial treatment for carbon monoxide poisoning is to immediately remove the person from the exposure without endangering further people. Those who are unconscious may require CPR on site. Administering oxygen via non-rebreather mask shortens the half life of carbon monoxide from 320 minutes to 80 minutes on normal air. Oxygen hastens the dissociation of carbon monoxide from carboxyhemoglobin, thus turning it back into hemoglobin. Due to the possible severe effects in the fetus, pregnant women are treated with oxygen for longer periods of time than non-pregnant people. Hyperbaric oxygen is also used in the treatment of carbon monoxide poisoning, as it may hasten dissociation of CO from carboxyhemoglobin and cytochrome oxidase to a greater extent than normal oxygen. Hyperbaric oxygen at three times atmospheric pressure reduces the half life of carbon monoxide to 23 (~80/3 minutes) minutes, compared to 80 minutes for oxygen at regular atmospheric pressure. It may also enhance oxygen transport to the tissues by plasma, partially bypassing the normal transfer through hemoglobin. However, it is controversial whether hyperbaric oxygen actually offers any extra benefits over normal high flow oxygen, in terms of increased survival or improved long-term outcomes. There have been randomized controlled trials in which the two treatment options have been compared; of the six performed, four found hyperbaric oxygen improved outcome and two found no benefit for hyperbaric oxygen. Some of these trials have been criticized for apparent flaws in their implementation. A review of all the literature on carbon monoxide poisoning treatment concluded that the role of hyperbaric oxygen is unclear and the available evidence neither confirms nor denies a medically meaningful benefit. The authors suggested a large, well designed, externally audited, multicentre trial to compare normal oxygen with hyperbaric oxygen. Further treatment for other complications such as seizure, hypotension, cardiac abnormalities, pulmonary edema, and acidosis may be required. Increased muscle activity and seizures should be treated with dantrolene or diazepam; diazepam should only be given with appropriate respiratory support. Hypotension requires treatment with intravenous fluids; vasopressors may be required to treat myocardial depression. Cardiac dysrhythmias are treated with standard advanced cardiac life support protocols. If severe, metabolic acidosis is treated with sodium bicarbonate. Treatment with sodium bicarbonate is controversial as acidosis may increase tissue oxygen availability. Treatment of acidosis may only need to consist of oxygen therapy. The delayed development of neuropsychiatric impairment is one of the most serious complications of carbon monoxide poisoning. Brain damage is confirmed following MRI or CAT scans. Extensive follow up and supportive treatment is often required for delayed neurological damage. Outcomes are often difficult to predict following poisoning, especially people who have symptoms of cardiac arrest, coma, metabolic acidosis, or have high carboxyhemoglobin levels. One study reported that approximately 30% of people with severe carbon monoxide poisoning will have a fatal outcome. It has been reported that electroconvulsive therapy (ECT) may increase the likelihood of delayed neuropsychiatric sequelae (DNS) after carbon monoxide (CO) poisoning. The earliest description of carbon monoxide poisoning date to at least 200 BC by Aristotle. Documented cases of carbon monoxide being used as a method of suicide date to at least 100 BC in ancient Rome. As part of the Holocaust during World War II, German Nazis used gas vans at Chelmno extermination camp and elsewhere to kill an estimated over 700,000 prisoners by carbon monoxide poisoning. This method was also used in the gas chambers of several death camps such as Treblinka, Sobibor and Belzec. Gassing with carbon monoxide started in action T4, the euthanasia programme developed by the Nazis in Germany to murder the mentally ill and disabled people before the war started in earnest. The gas was supplied by IG Farben in pressurized cylinders and fed by tubes into the gas chambers built at various mental hospitals, such as Hartheim Euthanasia Centre. Many key personnel were recruited from the T4 programme to murder much larger numbers of people in the gas vans and the special gas chambers used in the death camps such as Treblinka. Exhaust fumes from tank engines for example, were used to supply the gas to the chambers. 1 2 3 Prockop LD, Chichkova RI (Nov 2007). "Carbon monoxide intoxication: an updated review". Journal of the Neurological Sciences. 262 (1–2): 122–130. doi:10.1016/j.jns.2007.06.037. PMID 17720201. 1 2 3 4 Buckley NA, Isbister GK, Stokes B, Juurlink DN (2005). "Hyperbaric oxygen for carbon monoxide poisoning: a systematic review and critical analysis of the evidence". Toxicological Reviews. 24 (2): 75–92. doi:10.2165/00139709-200524020-00002. PMID 16180928. 1 2 3 4 Omaye ST (Nov 2002). "Metabolic modulation of carbon monoxide toxicity". Toxicology. 180 (2): 139–50. doi:10.1016/S0300-483X(02)00387-6. PMID 12324190. ↑ Albert Donnay (October 31, 2004). "A True Tale Of A Truly Haunted House". Ghostvillage.com. Retrieved 2008-12-16. 1 2 Ernst A, Zibrak JD (November 1998). "Carbon monoxide poisoning". The New England Journal of Medicine. 339 (22): 1603–1608. doi:10.1056/NEJM199811263392206. PMID 9828249. 1 2 3 4 Raub JA, Mathieu-Nolf M, Hampson NB, Thom SR (April 2000). "Carbon monoxide poisoning-a public health perspective". Toxicology. 145 (1): 1–14. doi:10.1016/S0300-483X(99)00217-6. PMID 10771127. 1 2 3 4 5 6 Kao LW, Nañagas KA (March 2006). "Toxicity associated with carbon monoxide". Clinics in Laboratory Medicine. 26 (1): 99–125. doi:10.1016/j.cll.2006.01.005. PMID 16567227. ↑ "OSHA Fact Sheet: Carbon Monoxide" (PDF). United States National Institute for Occupational Safety and Health. Retrieved 2009-09-14. ↑ "Carbon monoxide – 29 CFR Part 1917 Section 1917.24". United States Department of Labor: Occupational Safety and Health Administration. Retrieved 2013-05-27. ↑ Henry CR, Satran D, Lindgren B, Adkinson C, Nicholson CI, Henry TD (January 2006). "Myocardial Injury and Long-term Mortality Following Moderate to Severe Carbon Monoxide Poisoning" (Free full text). JAMA. 295 (4): 398–402. doi:10.1001/jama.295.4.398. PMID 16434630. ↑ "Carbon Monoxide". American Lung Association. Archived from the original on 2008-05-28. Retrieved 2009-09-14. ↑ Lipman GS (2006). "Carbon monoxide toxicity at high altitude". Wilderness & Environmental Medicine. 17 (2): 144–145. doi:10.1580/1080-6032(2006)17[144:CMTAHA]2.0.CO;2. PMID 16805152. ↑ first draft prepared by Mr J. Raub. (1999). Environmental Health Criteria 213 (Carbon Monoxide). Geneva: International Programme on Chemical Safety, World Health Organization. ISBN 92-4-157213-2. ↑ Goldstein M (December 2008). "Carbon monoxide poisoning". Journal of Emergency Nursing. 34 (6): 538–542. doi:10.1016/j.jen.2007.11.014. PMID 19022078. ↑ Struttmann T, Scheerer A, Prince TS, Goldstein LA (Nov 1998). "Unintentional carbon monoxide poisoning from an unlikely source". The Journal of the American Board of Family Practice. 11 (6): 481–484. doi:10.3122/jabfm.11.6.481. PMID 9876005. 1 2 3 4 5 6 Hardy KR, Thom SR (1994). "Pathophysiology and treatment of carbon monoxide poisoning". Journal of Toxicology. Clinical Toxicology. 32 (6): 613–629. doi:10.3109/15563659409017973. PMID 7966524. 1 2 3 4 5 6 7 8 9 10 11 12 13 14 Lewis Goldfrank; Neal Flomenbaum; Neal Lewin; Mary Ann Howland; Robert Hoffman; Lewis Nelson (2002). "Carbon Monoxide". Goldfrank's toxicologic emergencies (7th ed.). New York: McGraw-Hill. pp. 1689–1704. ISBN 0-07-136001-8. ↑ Hampson NB, Hampson LA (March 2002). "Characteristics of headache associated with acute carbon monoxide poisoning". Headache. 42 (3): 220–223. doi:10.1046/j.1526-4610.2002.02055.x. PMID 11903546. 1 2 Choi IS (June 2001). "Carbon monoxide poisoning: systemic manifestations and complications" (Free full text). Journal of Korean Medical Science. 16 (3): 253–261. PMC 3054741 . PMID 11410684. ↑ Tritapepe L, Macchiarelli G, Rocco M, Scopinaro F, Schillaci O, Martuscelli E, Motta PM (April 1998). "Functional and ultrastructural evidence of myocardial stunning after acute carbon monoxide poisoning". Critical Care Medicine. 26 (4): 797–801. doi:10.1097/00003246-199804000-00034. PMID 9559621. 1 2 3 4 Weaver LK (March 2009). "Clinical practice. Carbon monoxide poisoning". The New England Journal of Medicine. 360 (12): 1217–1225. doi:10.1056/NEJMcp0808891. PMID 19297574. 1 2 3 4 5 Shochat, Guy N (17 February 2009). "Toxicity, Carbon Monoxide". emedicine. Retrieved 2009-04-27. ↑ Marius-Nunez AL (February 1990). "Myocardial infarction with normal coronary arteries after acute exposure to carbon monoxide". Chest. 97 (2): 491–4. doi:10.1378/chest.97.2.491. PMID 2298080. ↑ Gandini C, Castoldi AF, Candura SM, Locatelli C, Butera R, Priori S, Manzo L (2001). "Carbon monoxide cardiotoxicity". Journal of Toxicology. Clinical Toxicology. 39 (1): 35–44. doi:10.1081/CLT-100102878. PMID 11327225. ↑ Sokal JA (December 1985). "The effect of exposure duration on the blood level of glucose, pyruvate and lactate in acute carbon monoxide intoxication in man". Journal of Applied Toxicology: JAT. 5 (6): 395–7. doi:10.1002/jat.2550050611. PMID 4078220. ↑ Choi IS (July 1983). "Delayed neurologic sequelae in carbon monoxide intoxication". Archives of Neurology. 40 (7): 433–435. doi:10.1001/archneur.1983.04050070063016. PMID 6860181. ↑ Roohi F, Kula RW, Mehta N (July 2001). "Twenty-nine years after carbon monoxide intoxication". Clinical Neurology and Neurosurgery. 103 (2): 92–95. doi:10.1016/S0303-8467(01)00119-6. PMID 11516551. ↑ Myers RA, Snyder SK, Emhoff TA (December 1985). "Subacute sequelae of carbon monoxide poisoning". Annals of Emergency Medicine. 14 (12): 1163–1167. doi:10.1016/S0196-0644(85)81022-2. PMID 4061987. 1 2 3 4 5 6 7 Bateman DN (October 2003). "Carbon Monoxide". Medicine. 31 (10): 233. doi:10.1383/medc.31.10.41.27810. ↑ Simini B (October 1998). "Cherry-red discolouration in carbon monoxide poisoning". Lancet. 352 (9134): 1154. doi:10.1016/S0140-6736(05)79807-X. PMID 9798630. ↑ Brooks DE, Lin E, Ahktar J (February 2002). "What is cherry red, and who cares?". The Journal of Emergency Medicine. 22 (2): 213–214. doi:10.1016/S0736-4679(01)00469-3. PMID 11858933. 1 2 3 4 Fawcett TA, Moon RE, Fracica PJ, Mebane GY, Theil DR, Piantadosi CA (January 1992). "Warehouse workers' headache. Carbon monoxide poisoning from propane-fueled forklifts". Journal of Occupational Medicine. 34 (1): 12–15. PMID 1552375. ↑ Ryan CM (1990). "Memory disturbances following chronic, low-level carbon monoxide exposure". Archives of Clinical Neuropsychology. 5 (1): 59–67. doi:10.1016/0887-6177(90)90007-C. PMID 14589544. ↑ Davutoglu, V (November 2009). "Chronic carbon monoxide exposure is associated with the increases in carotid intima-media thickness and C-reactive protein level". Tohoku J Exp Med. 219 (3): 201–6. doi:10.1620/tjem.219.201. ↑ Shephard, Roy (1983). Carbon Monoxide The Silent Killer. Springfield Illinois: Charles C Thomas. pp. 93–96. ↑ Allred EN, Bleecker ER, Chaitman BR, Dahms TE, Gottlieb SO, Hackney JD, Pagano M, Selvester RH, Walden SM, Warren J (Nov 1989). "Short-term effects of carbon monoxide exposure on the exercise performance of subjects with coronary artery disease". The New England Journal of Medicine. 321 (21): 1426–1432. doi:10.1056/NEJM198911233212102. PMID 2682242. 1 2 Green W. "An Introduction to Indoor Air Quality: Carbon Monoxide (CO)". United States Environmental Protection Agency. Retrieved 2008-12-16. ↑ Singer, Siegfried Fred. The Changing Global Environment. Dordrecht: D. Reidel Publishing Company. p. 90. 1 2 Gosink T (1983-01-28). "What Do Carbon Monoxide Levels Mean?". Alaska Science Forum. Geophysical Institute, University of Alaska Fairbanks. Retrieved 2008-12-16. ↑ "Man died from carbon monoxide poisoning after using 'heat beads' in Greystanes home". The Sydney Morning Herald. ↑ Marc B, Bouchez-Buvry A, Wepierre JL, Boniol L, Vaquero P, Garnier M (June 2001). "Carbon-monoxide poisoning in young drug addicts due to indoor use of a gasoline-powered generator". Journal of Clinical Forensic Medicine. 8 (2): 54–56. doi:10.1054/jcfm.2001.0474. PMID 16083675. ↑ Johnson C, Moran J, Paine S, Anderson H, Breysse P (October 1975). "Abatement of toxic levels of carbon monoxide in Seattle ice-skating rinks". American Journal of Public Health. 65 (10): 1087–1090. doi:10.2105/AJPH.65.10.1087. PMC 1776025 . PMID 1163706. ↑ "NIOSH Carbon Monoxide Hazards from Small Gasoline Powered Engines". United States National Institute for Occupational Safety and Health. Retrieved 2007-10-15. ↑ Fife CE, Smith LA, Maus EA, McCarthy JJ, Koehler MZ, Hawkins T, Hampson NB (June 2009). "Dying to play video games: carbon monoxide poisoning from electrical generators used after hurricane Ike". Pediatrics. 123 (6): e1035–8. doi:10.1542/peds.2008-3273. PMID 19482736. ↑ Emmerich, SJ (July 2011). Measured CO Concentrations at NIST IAQ Test House from Operation of Portable Electric Generators in Attached Garage – Interim Report (Report). United States National Institute of Standards and Technology. Retrieved 2012-04-18. ↑ Hampson NB, Norkool DM (January 1992). "Carbon monoxide poisoning in children riding in the back of pickup trucks". JAMA. 267 (4): 538–540. doi:10.1001/jama.267.4.538. PMID 1370334. ↑ Centers for Disease Control and Prevention (CDC) (January 1996). "Carbon monoxide poisonings associated with snow-obstructed vehicle exhaust systems—Philadelphia and New York City, January 1996". MMWR: Morbidity and Mortality Weekly Report. 45 (1): 1–3. PMID 8531914. ↑ Centers for Disease Control and Prevention (CDC) (December 2000). "Houseboat-associated carbon monoxide poisonings on Lake Powell—Arizona and Utah, 2000". MMWR: Morbidity and Mortality Weekly Report. 49 (49): 1105–1108. PMID 11917924. ↑ "NIOSH Carbon Monoxide Dangers in Boating". United States National Institute for Occupational Safety and Health. Retrieved 2007-10-15. ↑ Austin CC, Ecobichon DJ, Dussault G, Tirado C (December 1997). "Carbon monoxide and water vapor contamination of compressed breathing air for firefighters and divers". Journal of Toxicology and Environmental Health. 52 (5): 403–423. doi:10.1080/00984109708984073. PMID 9388533. ↑ Dart, RC (2004). Medical toxicology. Philadelphia: Williams & Wilkins. p. 1169. ISBN 0-7817-2845-2. ↑ van Veen, MP; Fortezza F; Spaans E; Mensinga TT (2002). "Non-professional paint stripping, model prediction and experimental validation of indoor dichloromethane levels". Indoor Air. 12 (2): 92–7. doi:10.1034/j.1600-0668.2002.01109.x. ↑ Kubic VL, Anders MW (March 1975). "Metabolism of dihalomethanes to carbon monoxide. II. In vitro studies". Drug metabolism and disposition. 3 (2): 104–112. PMID 236156. ↑ Dueñas A, Felipe S, Ruiz-Mambrilla M, Martín-Escudero JC, García-Calvo C (January 2000). "CO poisoning caused by inhalation of CH3Cl contained in personal defense spray". The American Journal of Emergency Medicine. 18 (1): 120–121. doi:10.1016/S0735-6757(00)90070-6. PMID 10674554. 1 2 3 4 Varon J, Marik PE, Fromm RE, Gueler A (1999). "Carbon monoxide poisoning: A review for clinicians". The Journal of Emergency Medicine. 17 (1): 87–93. doi:10.1016/S0736-4679(98)00128-0. PMID 9950394. 1 2 3 Gorman D, Drewry A, Huang YL, Sames C (May 2003). "The clinical toxicology of carbon monoxide". Toxicology. 187 (1): 25–38. doi:10.1016/S0300-483X(03)00005-2. PMID 12679050. ↑ Dunn, Robert B.; Kudrath, W.; Passo, S.S.; Wilson, L.B. (2011). "7-3". USMLE Step 1 Lecture Notes: Physiology. pp. 167–168. ↑ Townsend CL, Maynard RL (October 2002). "Effects on health of prolonged exposure to low concentrations of carbon monoxide". Occupational and Environmental Medicine. 59 (10): 708–711. doi:10.1136/oem.59.10.708. PMC 1740215 . PMID 12356933. ↑ Haldane J (1895). "The action of carbonic oxide on man" (PDF). The Journal of Physiology. 18 (5–6): 430–462. doi:10.1113/jphysiol.1895.sp000578. PMC 1514663 . PMID 16992272. ↑ Gorman DF, Runciman WB (November 1991). "Carbon monoxide poisoning". Anaesthesia and Intensive Care. 19 (4): 506–11. PMID 1750629. ↑ Alonso JR, Cardellach F, Lopez S, Casademont J, Miro O (September 2003). "Carbon monoxide specifically inhibits cytochrome c oxidase of human mitochondrial respiratory chain". Pharmacology & Toxicology. 93 (3): 142–146. doi:10.1034/j.1600-0773.2003.930306.x. PMID 12969439. 1 2 Blumenthal I (June 2001). "Carbon monoxide poisoning" (Free full text). Journal of the Royal Society of Medicine. 94 (6): 270–272. PMC 1281520 . PMID 11387414. ↑ Fan HC, Wang AC, Lo CP, Chang KP, Chen SJ (July 2009). "Damage of cerebellar white matter due to carbon monoxide poisoning: a case report". The American Journal of Emergency Medicine. 27 (6): 757.e5–e7. doi:10.1016/j.ajem.2008.10.021. PMID 19751650. ↑ Fukuhara M, Abe I, Matsumura K, Kaseda S, Yamashita Y, Shida K, Kawashima H, Fujishima M (April 1996). "Circadian variations of blood pressure in patients with sequelae of carbon monoxide poisoning". American Journal of Hypertension. 9 (4 Part 1): 300–305. doi:10.1016/0895-7061(95)00342-8. PMID 8722431. ↑ Greingor JL, Tosi JM, Ruhlmann S, Aussedat M (September 2001). "Acute carbon monoxide intoxication during pregnancy. One case report and review of the literature". Emergency Medicine Journal: EMJ. 18 (5): 399–401. doi:10.1136/emj.18.5.399. PMC 1725677 . PMID 11559621. ↑ Farrow JR, Davis GJ, Roy TM, McCloud LC, Nichols GR (November 1990). "Fetal death due to nonlethal maternal carbon monoxide poisoning". Journal of Forensic Sciences. 35 (6): 1448–1452. PMID 2262778. ↑ Bennetto L, Powter L, Scolding NJ (April 2008). "Accidental carbon monoxide poisoning presenting without a history of exposure: A case report". Journal of Medical Case Reports. 2 (1): 118. doi:10.1186/1752-1947-2-118. PMC 2390579 . PMID 18430228. ↑ Keleş A, Demircan A, Kurtoğlu G (June 2008). "Carbon monoxide poisoning: how many patients do we miss?". European Journal of Emergency Medicine. 15 (3): 154–157. doi:10.1097/MEJ.0b013e3282efd519. PMID 18460956. ↑ Rodkey FL, Hill TA, Pitts LL, Robertson RF (August 1979). "Spectrophotometric measurement of carboxyhemoglobin and methemoglobin in blood". Clinical Chemistry. 25 (8): 1388–1393. PMID 455674. Retrieved 2009-07-17. ↑ Rees PJ, Chilvers C, Clark TJ (January 1980). "Evaluation of methods used to estimate inhaled dose of carbon monoxide". Thorax. 35 (1): 47–51. doi:10.1136/thx.35.1.47. PMC 471219 . PMID 7361284. ↑ Coulange M, Barthelemy A, Hug F, Thierry AL, De Haro L (March 2008). "Reliability of new pulse CO-oximeter in victims of carbon monoxide poisoning". Undersea & Hyperbaric Medicine. 35 (2): 107–111. PMID 18500075. ↑ Maisel, William; Roger J. Lewis (2010). "Noninvasive Measurement of Carboxyhemoglobin: How Accurate is Accurate Enough?". Annals of Emergency Medicine. Boston, MA. 56 (4): 389–391. doi:10.1016/j.annemergmed.2010.05.025. ↑ Vegfors M, Lennmarken C (May 1991). "Carboxyhaemoglobinaemia and pulse oximetry". British Journal of Anaesthesia. 66 (5): 625–626. doi:10.1093/bja/66.5.625. PMID 2031826. ↑ Barker SJ, Tremper KK (May 1987). "The effect of carbon monoxide inhalation on pulse oximetry and transcutaneous PO2". Anesthesiology. 66 (5): 677–679. doi:10.1097/00000542-198705000-00014. PMID 3578881. ↑ Jarvis, M. (1986). "Low cost carbon monoxide monitors in smoking assessment". Thorax. 41: 886–887. doi:10.1136/thx.41.11.886. ↑ Wald, Nicholas (1981). "Carbon monoxide in breath in relation to smoking and carboxyhaemoglobin levels". Thorax. 36: 366–369. doi:10.1136/thx.36.5.366. PMC 471511 . PMID 7314006. ↑ Sato K, Tamaki K, Hattori H, et al. Determination of total hemoglobin in forensic blood samples with special reference to carboxyhemoglobin analysis. For. Sci. Int. 48: 89–96, 1990. ↑ R. Baselt, Disposition of Toxic Drugs and Chemicals in Man, 8th edition, Biomedical Publications, Foster City, CA, 2008, pp. 237–241. ↑ Ford MD, Delaney KA, Ling LJ, Erickson T, eds. (2001). Clinical toxicology. WB Saunders Company. p. 1046. ISBN 0-7216-5485-1. ↑ Ilano AL, Raffin TA (Jan 1990). "Management of carbon monoxide poisoning" (Free full text). Chest. 97 (1): 165–9. doi:10.1378/chest.97.1.165. PMID 2403894. ↑ Millar IL, Mouldey PG (2008). "Compressed breathing air – the potential for evil from within.". Diving and Hyperbaric Medicine. South Pacific Underwater Medicine Society. 38: 145–51. Retrieved 2013-04-14. 1 2 "Carbon Monoxide Detectors Can Save Lives: CPSC Document #5010". US Consumer Product Safety Commission. Archived from the original on 2009-04-09. Retrieved 2009-04-30. 1 2 Krenzelok EP, Roth R, Full R (September 1996). "Carbon monoxide ... the silent killer with an audible solution". The American Journal of Emergency Medicine. 14 (5): 484–486. doi:10.1016/S0735-6757(96)90159-X. PMID 8765117. ↑ Lipinski, Edward R (February 14, 1999). "Keeping Watch on Carbon Monoxide". New York Times. Retrieved 2009-09-09. ↑ Yoon SS, Macdonald SC, Parrish RG (March 1998). "Deaths from unintentional carbon monoxide poisoning and potential for prevention with carbon monoxide detectors". JAMA. 279 (9): 685–687. doi:10.1001/jama.279.9.685. PMID 9496987. ↑ "Carbon Monoxide Detector Placement". homesafe.com. Retrieved 2013-05-27. 1 2 3 NFPA 720: Standard for the Installation of Carbon Monoxide (CO) Detection and Warning Equipment. Quincy, MA: National Fire Protection Agency. 2009. ↑ "Gas Safety in the Home". UK Gas Safe Register. Archived from the original on 2013-05-02. Retrieved 2013-05-27. ↑ "MGL Ch. 148 §28F 1⁄2 – Nicole's Law, effective March 31, 2006". malegislature.gov. ↑ "Archived copy". Archived from the original on 2013-03-05. Retrieved 2013-02-22. 1 2 Olson KR (1984). "Carbon monoxide poisoning: Mechanisms, presentation, and controversies in management". The Journal of Emergency Medicine. 1 (3): 233–243. doi:10.1016/0736-4679(84)90078-7. PMID 6491241. ↑ Margulies JL (November 1986). "Acute carbon monoxide poisoning during pregnancy". The American Journal of Emergency Medicine. 4 (6): 516–519. doi:10.1016/S0735-6757(86)80008-0. PMID 3778597. ↑ Brown DB, Mueller GL, Golich FC (November 1992). "Hyperbaric oxygen treatment for carbon monoxide poisoning in pregnancy: a case report". Aviation, Space, and Environmental Medicine. 63 (11): 1011–1014. PMID 1445151. ↑ Juurlink DN, Buckley NA, Stanbrook MB, Isbister GK, Bennett M, McGuigan MA (January 2005). Juurlink DN, ed. "Hyperbaric oxygen for carbon monoxide poisoning". Cochrane Database of Systematic Reviews (1): CD002041. doi:10.1002/14651858.CD002041.pub2. PMID 15674890. ↑ Henry JA (2005). "Hyperbaric therapy for carbon monoxide poisoning: to treat or not to treat, that is the question". Toxicological Reviews. 24 (3): 149–150. doi:10.2165/00139709-200524030-00002. PMID 16390211. ↑ Olson KR (2005). "Hyperbaric oxygen or normobaric oxygen?". Toxicological Reviews. 24 (3): 151. doi:10.2165/00139709-200524030-00003. PMID 16390212. ↑ Seger D (2005). "The myth". Toxicological Reviews. 24 (3): 155–156. doi:10.2165/00139709-200524030-00005. PMID 16390214. ↑ Thom SR (2005). "Hyperbaric oxygen therapy for carbon monoxide poisoning: Is it time to end the debates?". Toxicological Reviews. 24 (3): 157–158. doi:10.2165/00139709-200524030-00006. PMID 16390215. ↑ Scheinkestel CD, Bailey M, Myles PS, Jones K, Cooper DJ, Millar IL, Tuxen DV (March 1999). "Hyperbaric or normobaric oxygen for acute carbon monoxide poisoning: a randomized controlled clinical trial" (Free full text). The Medical Journal of Australia. 170 (5): 203–210. PMID 10092916. ↑ Thom SR, Taber RL, Mendiguren II, Clark JM, Hardy KR, Fisher AB (April 1995). "Delayed neuropsychologic sequelae after carbon monoxide poisoning: prevention by treatment with hyperbaric oxygen". Annals of Emergency Medicine. 25 (4): 474–480. doi:10.1016/S0196-0644(95)70261-X. PMID 7710151. ↑ Raphael JC, Elkharrat D, Jars-Guincestre MC, Chastang C, Chasles V, Vercken JB, Gajdos P (August 1989). "Trial of normobaric and hyperbaric oxygen for acute carbon monoxide intoxication". Lancet. 2 (8660): 414–419. doi:10.1016/S0140-6736(89)90592-8. PMID 2569600. ↑ Ducasse JL, Celsis P, Marc-Vergnes JP (March 1995). "Non-comatose patients with acute carbon monoxide poisoning: hyperbaric or normobaric oxygenation?". Undersea & Hyperbaric Medicine. 22 (1): 9–15. PMID 7742714. ↑ Mathieu D, Mathieu-Nolf M, Durak C, Wattel F, Tempe JP, Bouachour G, Sainty JM (1996). "Randomized prospective study comparing the effect of HBO vs 12 hours NBO in non-comatose CO-poisoned patients: results of the preliminary analysis". Undersea & Hyperbaric Medicine. 23: 7. ↑ Weaver LK, Hopkins RO, Chan KJ, Churchill S, Elliott CG, Clemmer TP, Orme JF, Thomas FO, Morris AH (October 2002). "Hyperbaric oxygen for acute carbon monoxide poisoning". The New England Journal of Medicine. 347 (14): 1057–1067. doi:10.1056/NEJMoa013121. PMID 12362006. ↑ Gorman DF. (June 1999). "Hyperbaric or normobaric oxygen for acute carbon monoxide poisoning: a randomised controlled clinical trial. Unfortunate methodological flaws". The Medical Journal of Australia. 170 (11): 563. PMID 10397050. ↑ Scheinkestel CD, Jones K, Myles PS, Cooper DJ, Millar IL, Tuxen DV (April 2004). "Where to now with carbon monoxide poisoning?". Emergency Medicine Australasia: EMA. 16 (2): 151–154. doi:10.1111/j.1742-6723.2004.00567.x. PMID 15239731. ↑ Isbister GK, McGettigan P, Harris I (February 2003). "Hyperbaric oxygen for acute carbon monoxide poisoning". The New England Journal of Medicine. 348 (6): 557–560. doi:10.1056/NEJM200302063480615. PMID 12572577. ↑ Buckley NA, Juurlink DN (June 2013). "Carbon monoxide treatment guidelines must acknowledge the limitations of the existing evidence". American Journal of Respiratory and Critical Care Medicine. 187 (12): 1390. doi:10.1164/rccm.201212-2262LE. PMID 23767905. ↑ Tomaszewski C (January 1999). "Carbon monoxide poisoning. Early awareness and intervention can save lives". Postgraduate Medicine. 105 (1): 39–40, 43–48, 50. doi:10.3810/pgm.1999.01.496. PMID 9924492. ↑ Peirce EC (1986). "Treating acidemia in carbon monoxide poisoning may be dangerous". Journal of Hyperbaric Medicine. 1 (2): 87–97. ↑ Devine SA, Kirkley SM, Palumbo CL, White RF (October 2002). "MRI and neuropsychological correlates of carbon monoxide exposure: a case report". Environmental Health Perspectives. 110 (10): 1051–1055. doi:10.1289/ehp.021101051. PMC 1241033 . PMID 12361932. ↑ O'Donnell P, Buxton PJ, Pitkin A, Jarvis LJ (April 2000). "The magnetic resonance imaging appearances of the brain in acute carbon monoxide poisoning". Clinical Radiology. 55 (4): 273–280. doi:10.1053/crad.1999.0369. PMID 10767186. ↑ Seger D, Welch L (August 1994). "Carbon monoxide controversies: neuropsychologic testing, mechanism of toxicity, and hyperbaric oxygen". Annals of Emergency Medicine. 24 (2): 242–248. doi:10.1016/S0196-0644(94)70136-9. PMID 8037390. ↑ Chiang, CL; Tseng, MC (27 September 2011). "Safe use of electroconvulsive therapy in a highly suicidal survivor of carbon monoxide poisoning.". Gen Hosp Psychiatry. ↑ Thom SR (October 2002). "Hyperbaric-oxygen therapy for acute carbon monoxide poisoning". The New England Journal of Medicine. 347 (14): 1105–1106. doi:10.1056/NEJMe020103. PMID 12362013. ↑ Ernst A, Zibrak JD (November 1998). "Carbon monoxide poisoning". The New England Journal of Medicine. 339 (22): 1603–8. doi:10.1056/NEJM199811263392206. PMID 9828249. ↑ Centers for Disease Control and Prevention (CDC) (November 1996). "Deaths from motor-vehicle-related unintentional carbon monoxide poisoning—Colorado, 1996, New Mexico, 1980–1995, and United States, 1979–1992". MMWR. Morbidity and Mortality Weekly Report. 45 (47): 1029–32. PMID 8965803. ↑ Partrick M, Fiesseler F, Shih R, Riggs R, Hung O (2009). "Monthly variations in the diagnosis of carbon monoxide exposures in the emergency department". Undersea & Hyperbaric Medicine: Journal of the Undersea and Hyperbaric Medical Society, Inc. 36 (3): 161–7. PMID 19860138. ↑ Heckerling PS (May 1987). "Occult carbon monoxide poisoning: a cause of winter headache". The American Journal of Emergency Medicine. 5 (3): 201–4. doi:10.1016/0735-6757(87)90320-2. PMID 3580051. ↑ "Department of Public Health Warns of Dangers of Carbon Monoxide Poisoning During Power Outages". Tower Generator. Retrieved 2011-11-23. ↑ "Avoiding Carbon Monoxide poisoning during a power outage". CDC. Archived from the original on 2011-12-12. Retrieved 2011-11-23. ↑ Klein, Kelly; Herzog, Perri; Smolinske, Susan; White, Suzanne (2007). "Demand for poison control center services "surged" during the 2003 blackout.". Clinical Toxicology. 45 (3): 248–254. doi:10.1080/15563650601031676. ↑ Hampson NB (September 1998). "Emergency department visits for carbon monoxide poisoning in the Pacific Northwest". The Journal of Emergency Medicine. 16 (5): 695–698. doi:10.1016/S0736-4679(98)00080-8. PMID 9752939. ↑ "2004 Addendum to Overseas and Australian Statistics and Benchmarks for Customer Gas Safety Incidents" (PDF). Office of Gas Safety, Victoria. 2004. ↑ "The risk of carbon monoxide poisoning from domestic gas appliances" (PDF). Report to the Department of Resources, Energy and Tourism. Feb 2012. Archived from the original (PDF) on 2015-03-12. 1 2 Cobb N, Etzel RA (August 7, 1991). "Unintentional carbon monoxide-related deaths in the United States, 1979 through 1988". JAMA. 266 (5): 659–663. doi:10.1001/jama.266.5.659. PMID 1712865. ↑ "Carbon Monoxide poisoning fact sheet" (pdf). Centers for Disease Control and Prevention. July 2006. Retrieved 2008-12-16. ↑ McDowell R, Fowles J, Phillips D (November 2005). "Deaths from poisoning in New Zealand: 2001–2002" (Free full text). The New Zealand Medical Journal. 118 (1225): U1725. PMID 16286939. ↑ Song KJ, Shin SD, Cone DC (September 2009). "Socioeconomic status and severity-based incidence of poisoning: a nationwide cohort study". Clinical toxicology (Philadelphia, Pa.). 47 (8): 818–826. doi:10.1080/15563650903158870. PMID 19640232. ↑ Salameh S, Amitai Y, Antopolsky M, Rott D, Stalnicowicz R (February 2009). "Carbon monoxide poisoning in Jerusalem: epidemiology and risk factors". Clinical Toxicology (Philadelphia, Pa.). 47 (2): 137–41. doi:10.1080/15563650801986711. PMID 18720104. ↑ Liu Q, Zhou L, Zheng N, Zhuo L, Liu Y, Liu L (December 2009). "Poisoning deaths in China: type and prevalence detected at the Tongji Forensic Medical Center in Hubei". Forensic Science International. 193 (1–3): 88–94. doi:10.1016/j.forsciint.2009.09.013. PMID 19854011. 1 2 3 4 Penney, David G. (2007). Carbon Monoxide Poisoning. CRC Press. p. 754. ISBN 9780849384189. 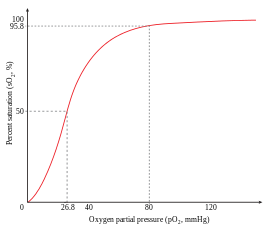 ↑ Totten S, Bartrop P, Markusen E (2007). Dictionary of Genocide. Greenwood. pp. 129, 156. ↑ Foresti, R; Bani-Hani, MG; Motterlini, R (April 2008). "Use of carbon monoxide as a therapeutic agent: promises and challenges.". Intensive Care Medicine. 34 (4): 649–58. doi:10.1007/s00134-008-1011-1. PMID 18286265.